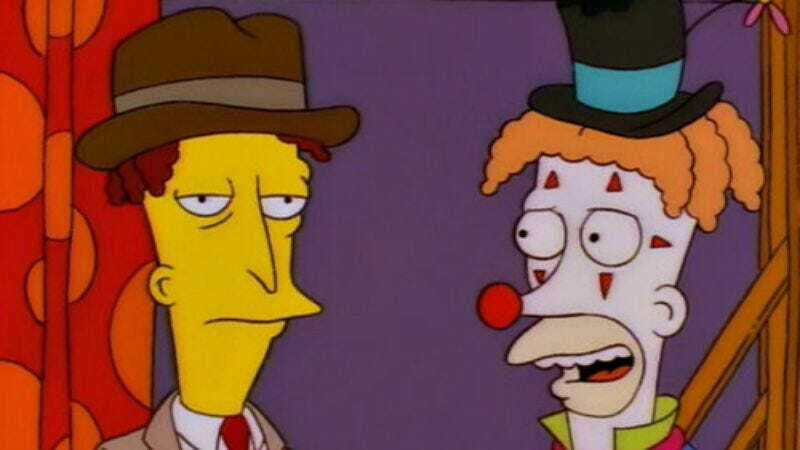 Sideshow Bob and Bart Simpson have a long and tangled history, but to me the ex-clown has always been a sympathetic character. By season eight of The Simpsons, he’s been shunned in favor of Krusty, and tries to bring the people of Springfield a high culture they don’t even want. Sure, he married Selma Bouvier under false pretenses and tried to take out Springfield with a nuclear device, but he usually had his own noble cause in mind, like the destruction of television. But Springfield, like all of us, loves a comeback story, and Reverend Lovejoy sets Bob up with a work-release job alongside his brother Cecil (David Hyde Pierce), a hydrological and hydrodynamical engineer. Out of prison, Sideshow Bob is a law-abiding citizen, working his job and dating Edna Krabappel; Bart is the one stalking his nemesis wherever he goes and rifling through his garbage, as sneaky as Bob himself. Although Bart starts out by calling Bob “pure evil,” I think by the end of the episode even Bart knows that that statement is not entirely true. The best parts of “Brother From Another Series” are when Bob protests his continued innocence: He’s so smart and savvy, imagine if he used his powers for good! Pierce seamlessly slips into his familiar role as Kelsey Grammer’s brother, although his slightly stilted vocal performance highlights how hard it is to live up to Grammer’s malevolently melodious tones. This enables a variety of funny Frasier parallels, like the title card, the apartment set, and the pretentious descriptions of wine. In the commentary, the Simpsons staff states that they were trying “to make as blandly a flat statement that we were ripping the show off” as they could. The audition helpfully makes the twist ending of the episode possible: The revenge-happy Terwilliger family eventually turns brother against brother. The showdown at the dam leads to one of the series’ nimblest action sequences: an M.C. Escher-inspired multiple stairway chase, followed by a super-powered water slide, followed by the suspenseful showdown at the edge of the dam when Bob, seeing Bart hurtling in mid-air, swings down off of the fuse from a stack of dynamite. He catches Bart, then (seemingly) sacrifices both of their lives to save the entire town. It’s the noblest effort ever by Bob—and it barely gets recognized! I have to say, I understand his frustration: Bob tells Bart he saved him, but Bob saved Bart as well, heroically so. But in the ultimate indignity, Bob is judged as guilty as Cecil in the end. During an engaging sequence in which Lou gets promoted and demoted several times, a disinterested and disinvested Chief Wiggum ends up sending both Terwilliger brothers to the slammer. For Bob, disappointingly, there’s no way out. For the brothers: One of the great things about Frasier is that it highlighted Frasier and Niles’ sibling rivalry, which still existed even among two accomplished professionals. Here the super-criminal and the engineer are reduced to sharing a cell and childishly slap-fighting over who gets the top bunk. “Brother From Another Series” marks a turning point for the relationship between Sideshow Bob and Bart. As Bob tries to get Lisa and Bart to escape with him in the water-slide sequence, at first Bart refuses, since, by his sixth appearance, Bob has been after Bart any number of times. But to save him in this instance, Bob stresses, “Bart, you have to trust me,” and Bart does. There are still plenty of times when Sideshow Bob goes after Bart, but after this episode, there are also a few where Bob is unable to kill him, saying he’s “grown accustomed to his face.” Perhaps they’re not the archenemies they thought they were and, as this episode shows, they’re not that dissimilar after all. The DVD set commentary features not only Matt Groening but Kelsey Grammer himself, who calls Sideshow Bob the “most popular character I’ve ever played.” Although he jokes that this episode highlighted how much he was “condemned to repeat my performance on Frasier,” he also notes, “I really like this one.” Grammer also explains that Bob’s intonations are based on one of his first drama teachers, Ellis Raab. That’s David Hyde Pierce yelling out “Probably!” in the crowd, responding to Bob’s question if he’s entitled to a second chance. He just wanted to play a guy in the crowd. 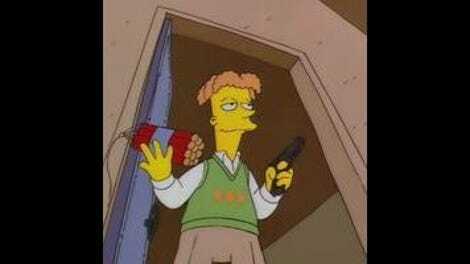 You only get one shot with Edna Krabappel.